Customer satisfaction is the most important goal for us as manufacturer of machine tools as well as essential machine components. If there is any fault or malfunction with our machines or components, we can offer you a fast and competent worldwide service by our own service technicians, to keep the downtime of the machines to a minimum. The machines of WMZ are known for their durability. To preserve the availlability and therefore to prevent production downtimes, we offer inspections for our customers. For this purpose, our field representatives will check the machine/s at your location. Following this, necessary repair work will be summarized as one quotation. Depending on the scope of work to be performed, this can be done on location or at WMZ. Inspection on location and dtermination of the scope of work. Dismantling of the machine and transfer to WMZ. Rebuilt machine with new parts. 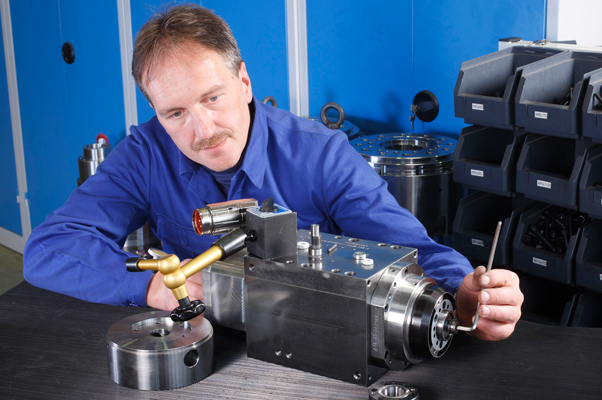 Trial machining runs and in-house QA inspections and approvals. Trial machining runs with our experts on your location. For planned as well as unexpected repair work our qualified personnel is availlable for you. For our customers this means that all repair and maintenance of the machines is performed by our service technicians, using their professional Know-How to assure a prompt service. Preventive maintenance and overhaul is worth its cost. These are prerequisites for a long lifespan and availlability without unwanted production downtimes. For this reason we recommend to our customers to have their machines looked at and maintained by our personnel on a regular basis. We would be glad to create an individually tailored maintenance and service plan for your machines during run-up operations. During these demanding and challenging times, the availlability and reliability of a manufacturing machine determines the profitability of this investment. The optimal qualification of the employees of our customers is therefor an important requirement. We are offering competent education and training for qualified personnel by using individual, customer specific training courses. Machinery, maintenance or programming training, WMZ is offering you the desired support directly at your location or with objects in our house. Get the best possible benefit, because knowledge comes first, when using tool machinery, their components, their usage and implementation and last but not least their competent operation. Original WMZ Spare Parts are produced using our original drawings and designs. This guarantees a consistent high quality. All original WMZ spare parts are tested by our own quality control. For spare parts, which are to be designated as wear and tear parts, we always have a stock availlable for our customers.